In the early Fall of 1966, I got a phone call from my friend, Carl, who said, "I just answered a want ad about a guitar for sale, and you won't believe this crazy instrument I saw." Carl tried to describe it, but ran short of words, so he just gave me the ad and told me to go take a look for myself. I called the number and went out right away. I was amazed at the cool guitar and surprised that everyone had passed up such a great opportunity, and bought it immediately for the asking price of $85.00. The fellow selling the guitar said it belonged to a friend who was a nun whose father had played it in dance bands. She was really into the "Singing Nun" and was going to use the money to get a nylon string classical guitar. In the thirty-plus years I've had that style "O" I've gotten all kinds of grief from friends who laugh when I tell them I really like the way it looks and sounds. 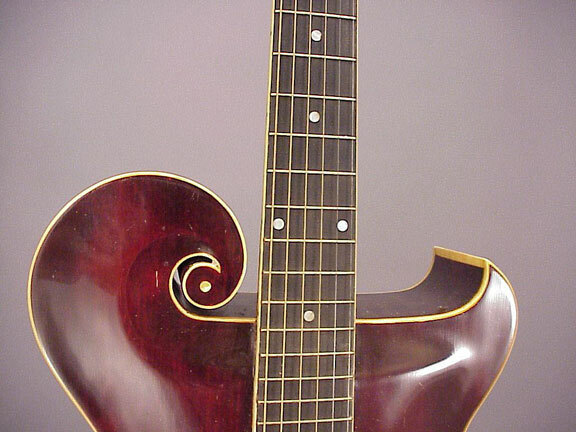 My old style "O" is not as swell as the one in these photos,and admittedly the style "O" is kind of an old clunk by today's jazz guitar standards, but to me, it's an incredibly cool old relic. The neck is HUGE in cross section, it has no adjustable truss rod and a nonadjustable bridge, but otherwise, it's similar to this one. Being a mandolin player, I really appreciate the styling. 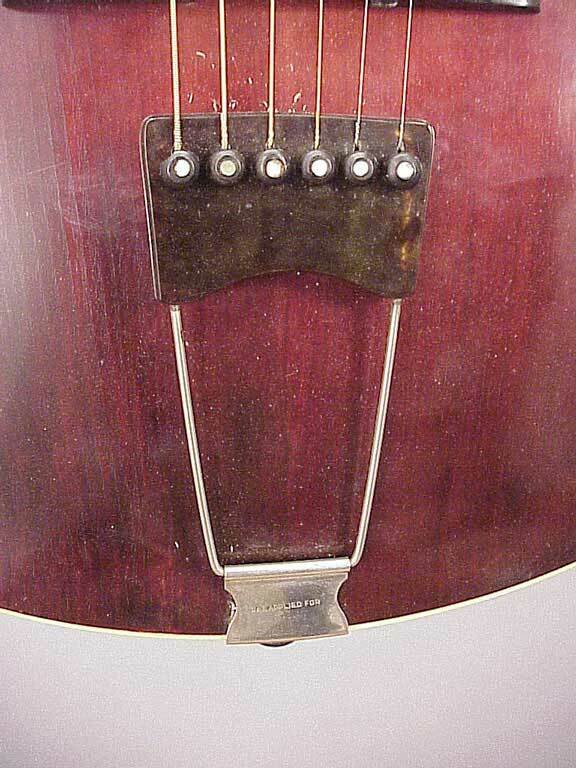 Until the advent of the f-hole style L-5 guitar, the style "O" was Gibson's most expensive and deluxe guitar. Notice how the upper section of the body presages the coming of the cutaway in the late 1930s. 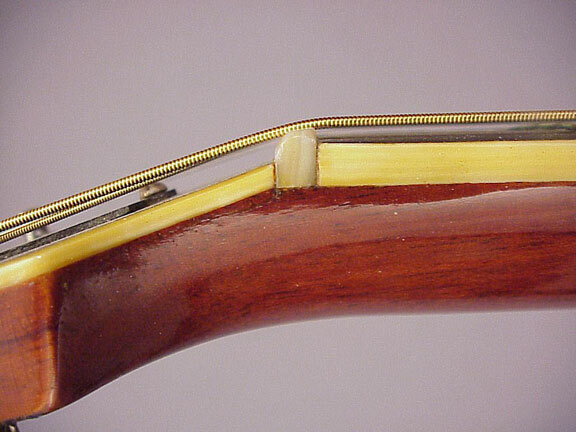 The neck joins the body at the 15th fret, as compared to most contemporary guitars, with their 12 frets clear. 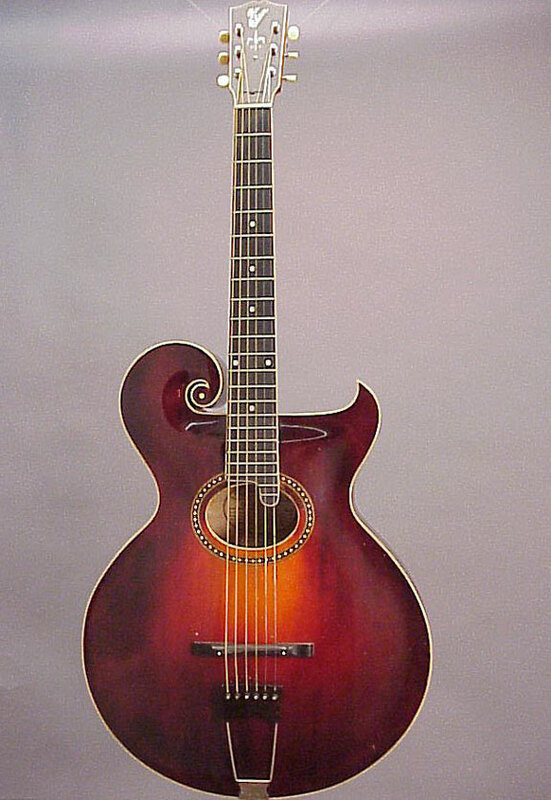 This guitar is an example of the last stage in the development of the style "O" because the L-5 had just been introduced in 1923, and the "O" was on its way out. The L-5 and other f-hole guitars would soon dominate the jazz scene, with their greater power and much slimmer more playable necks. 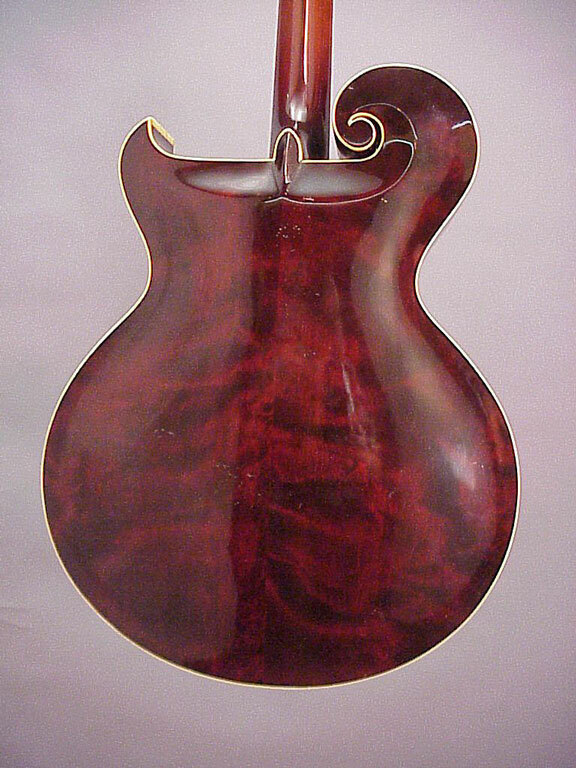 All style "O" guitars have birch backs and sides, and the back of this deluxe model is nicely figured. 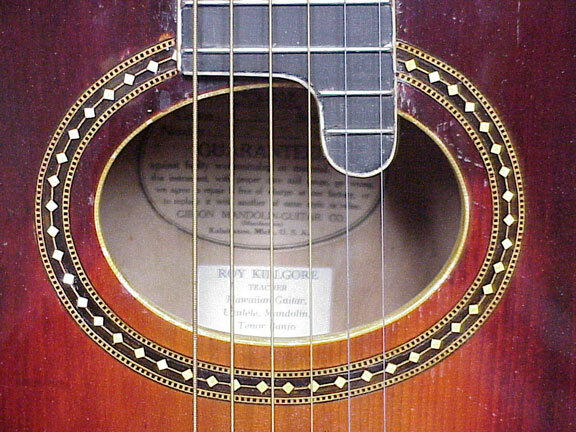 The rectangular label under the Gibson label is from its original owner, Roy Kilgore, musician and teacher, of Grand Rapids, Michigan. It is likely he was a "teacher-agent" who sold new Gibson guitars to his students. The celluloid tailpiece is from an earlier instrument. 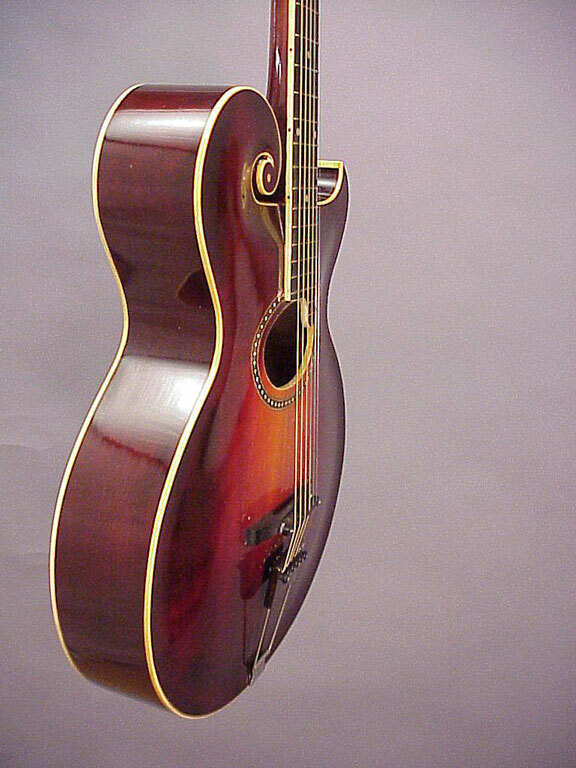 This 1924 model would have had an all metal tailpiece, the same as the L-5 of that year. The celluloid fingerrest is missing, by the way. The truss rod cover. The truss rod was a brand new feature, and was added to the style "O" but the neck was left very fat instead of being slim as the L-5's. With the super heavy neck, strong enough for any strings, and the truss rod inside, it's like having the benefit of both belt and suspenders! The nut. 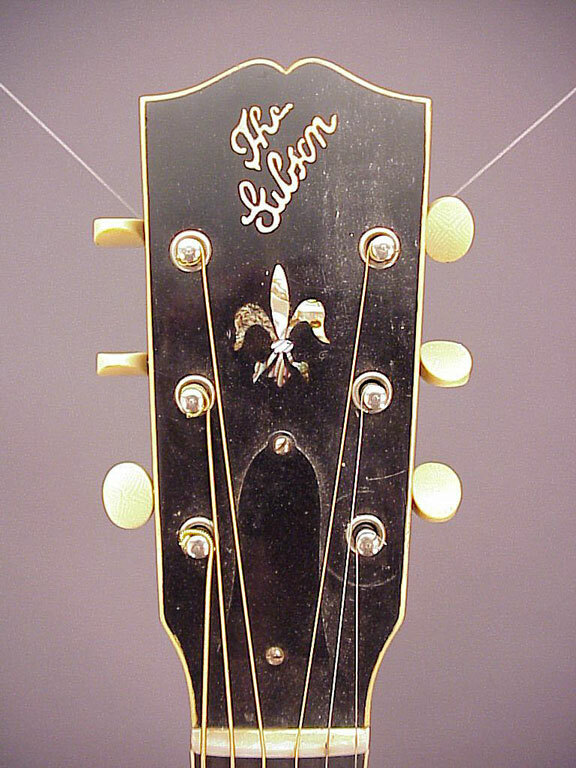 Only a very few deluxe Gibson instruments were fitted with genuine mother of pearl nuts. The last of the "O" model guitars got pearl nuts as part of the upgrade package of goodies that was applied when the L-5 was introduced.